The former White Elephant Saloon in downtown Fredericksburg. Throughout the country, there are spots with great hiking, spots with great museums and historical sites, and spots with good food and drinks. The area around Fredericksburg, Texas, has all three and more. Start with a walking tour of the town. Go to the Visitor Information Center to get a map (ask for the Historic District map). The walk includes many historical stops along with interesting stonework and ironwork. The buildings use local limestone and were built by immigrant stonemasons. 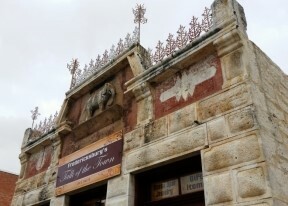 Look for the stone elephant façade. Along the tour is the Pioneer Museum ($7.50 per person) and is well-rated. The Vereins Kirche Museum is small but free and quite interesting. Honestly, we never finished the complete tour since samples at the winery and lunch at a brewery slowed us down. You may want to spend a couple of days just with this walk. 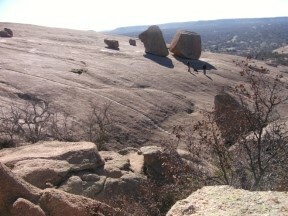 Hike to the top of Enchanted Rock. The hike isn’t long (0.6 miles), but the elevation makes it a challenge. Views are terrific at the top of this pink granite monolith. Watch for the flowers, plants, and lizards hiding in the cracks. Evidence has been found of humans living here for 10,000 years. The stories and legends of this haunted rock may be the best part. They say flickering “ghost” lights have been seen at night and the rocks groan. Supposedly if you stay overnight on the rock you will become invisible. As a warning, one legend says that bad fortune and death will befall anyone who climbs the rock with bad intent. So, think good thoughts! 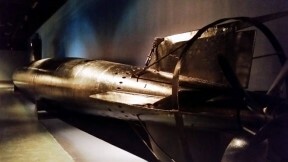 A Japanese submarine from the Pearl Harbor attack. Admiral Nimitz was born in Fredericksburg and was the Commander in Chief, U.S. Pacific Fleet during World War II. In his honor, the National Museum of the Pacific War was built, and it is amazing! The museum is full of authentic pieces, from war posters to a submarine and a tank. Displays along with short movies or audio from people that were there help explain what it was really like. Tickets are good for two days. Fort Martin Scott was built to protect wagon trains traveling the area. One thing we heard was that several soldiers slept together in a large bed fully dressed. If they were needed, they slid off the end of the bed and were ready. The bed is tilted to help with this. Oh, and I love the brass cannon. Another cool thing to see was the plane that he used to fly into the ranch. 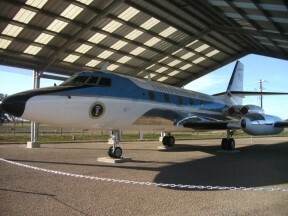 Technically it was Air Force One whenever he flew in it, but he used to call it Air Force One Half since it was smaller than the larger official plane. Red granite and ironwork at Der Stadt Friedhof. Even the cemeteries are special; especially Der Stadt Friedhof (German for “The City Cemetery”). Many of the stones use local limestone but it is the red granite from the area that stands out. The ironwork that surrounds some of the family or single plots is fascinating. 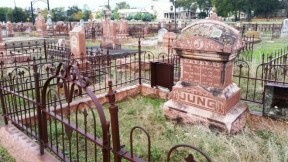 Within this pioneer cemetery, many of the inscriptions are in German. Most sections are laid out over time instead of by families so people who died from a cholera epidemic may be in the same section or perhaps in a group grave. Look for the area for children where the ironwork is reminiscent of cribs. The many sculptures include a cherub by Elisabet Ney whose works are displayed in the Texas State Capitol and the U.S. Capitol. There are many wineries to visit in the area. Go to the Fredericksburg Visitor Center to get the latest information since new ones frequently open. There are also lots of tours so you don’t have to drive. Have a beer and a sandwich while relaxing to great music. 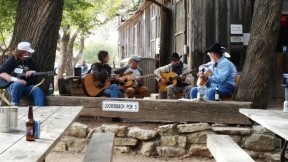 If you're a country music fan, you've heard of Luckenbach, Texas, as a song by Waylon Jennings and Willie Nelson. Luckenbach is just such a relaxing place that is well worth the drive even if country is not your style. We grabbed a sandwich and a beer and enjoyed listening to the free music from the musicians that showed up for a Picker Circle. If you have the desire, you can join in, too. The whole thing is very mellow, with people of all ages included. Bikers, tourists, locals, and musicians are all here to enjoy the day. Look for the roosters wandering around along with the longhorn steer that may show up. Besides all these things, if you time it right, Texas bluebonnets will be in bloom to further decorate Fredericksburg.